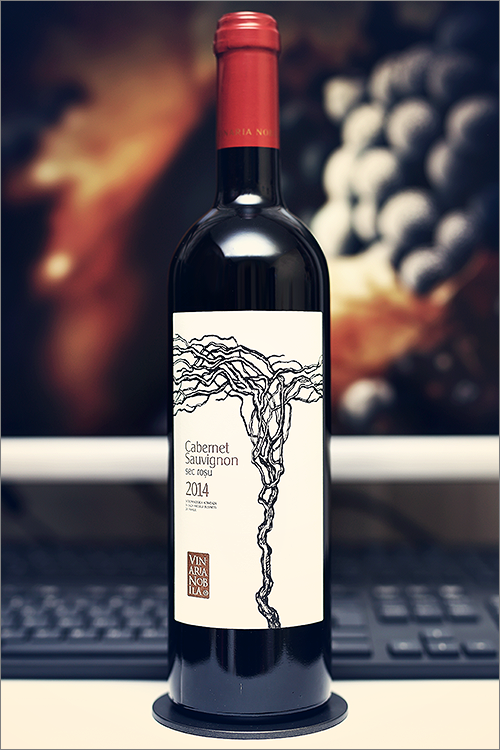 Today we are going to review another cabernet sauvignon wine – Cabernet Sauvignon 2014 from Vinaria Nobila. Cabernet sauvignon is a late ripening variety, the progeny of cabernet franc and sauvignon blanc, the world’s most famous red wine grape and the most planted one of any colour, that is grown all over the world in a wide range of climates, yet it does particularly well in the warmer regions. One can find many good to very good cabernet sauvignon wines almost in every wine-producing country and Moldova is no exception. This is one of the flagship wines from Vinaria Nobila and it has been aged for 24 months in new oak barrels, which is quite a lot, but let’s not put too much emphasis into the theory, let’s move on with the tasting and find out just how good this wine really is! Noble ruby color, not too deep, yet quite opaque, with some bright copper hues towards the rim of the glass. The nose is strong, filled mostly with black fruits and spice: black cherry, black mulberry, ripe sour cherry, blackcurrant, black plum, blackberry, cranberry, red and black pepper. An instant later the nose is filled with notes of medium roasted oakwood, dried sweet cherry, rooibos tea, nutmeg, dried cranberry and some subtle hints of sweet tobacco. The wine is dry, with high alcohol level, high acidity and firm tannin. It feels firm, bold and extracted, with hot and warm alcoholic accent. This is a quite oaky, spicy and fruity wine, as it tastes a bit too austere and angular. The wine has a fair overall balance, yet the wood dominates over the fruit, as a result the wine feels muscular and sharp despite its elegance and complexity. It has a medium-plus finish and an balanced, bitter-seedy aftertaste. Conclusion: this is a wine that is too young to drink now, as its sharpness and angularity has yet to settle down. We recommend a bit more bottle ageing (2 to 3 years at least), so that the wine will get closer to its prime form. Despite its youthfulness, the wine has plenty of tannic grip on the palate and a dense, rich, and enormously concentrated palate, which is mixing power with finesse. We would recommend to pair this wine with meaty dishes rich in umami and spice, as we believe it will match well with spicy curries and asian cuisine, like for example an asian tenderloin steak or a spicy flank steak with ginger and soy sauce marinade, so that all the angularity in the wine will be perfectly complemented by the spiciness of the dish. Enjoy!